The PCIUSB3S22 2-Port PCI to USB 3.0 Card enables you to connect USB 3.0 peripherals to a PC through a legacy PCI host bus, which doubles the data transfer speeds when used with USB 3.0 peripherals than would be possible with a USB 2.0 host connection - up to 1.3 Gbps (PCI bus limit). 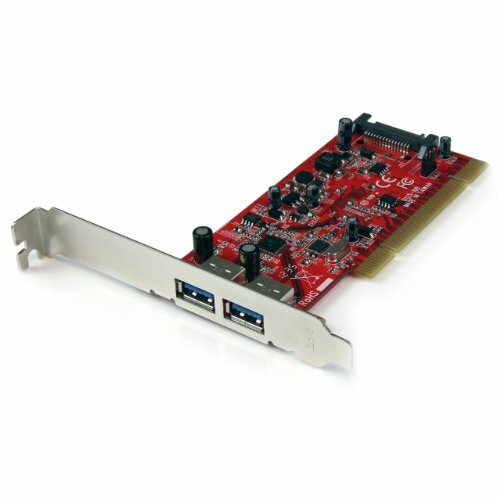 The card features an optional SATA power connection, which enables each port to supply up to 900mA of power to USB 3.0 bus-powered devices. By supporting a legacy (PCI) host connection, the card adds updated peripheral connectivity, without having to upgrade to a PCIe-equipped motherboard or rely on the backward compatibility of USB 3.0 peripherals. Guaranteed to provide reliable performance, the PCIUSB3S22 PCI USB 3.0 card is backed by lifetime warranty and free lifetime technical support.